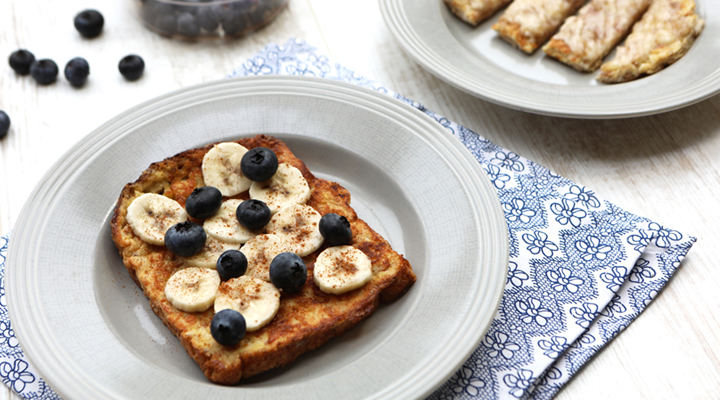 This baby friendly Cinnamon French Toast is a delicious breakfast for the family, including your weaning baby! It’s a tasty twist on the simple classic and is topped with berries and banana for a natural sweetness. 1. Place a pan on medium heat. Drizzle with oil and a little butter. 2. Crack the eggs into a bowl and whisk. Add milk and vanilla essence and combine. 3. Pick the bread up with a fork and dip back and front in egg mixture, one at a time. 4. Transfer to the preheated pan. Fry for a minute on either side until golden. 5. Place on a plate. Top with sliced banana, blueberries and sprinkle with cinnamon. Slice into fingers for a great breakfast or midday feed for your weaning baby. Suitable from 6 months+ of your baby's weaning journey. Slice into fingers and serve with mashed banana as a dip for baby to have a hands on feeding experience.